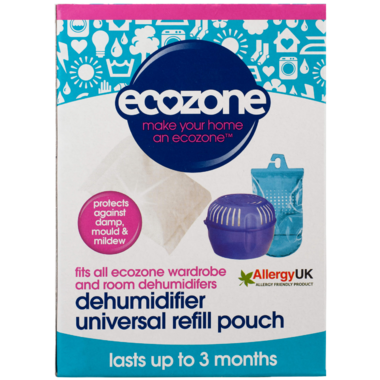 The Ecozone Dehumidifier Refill Pouch is suitable for use with the Ecozone Wardrobe Dehumidifier and the Ecozone Room Dehumidifier. Great value, the refill pouch will continue to protect against damp, mildew and musty smells for up to 3 months, without the need to buy a complete dehumidifying system. The innovative no mess bag is easy to use just dispose of the previous pouch and replace with a new one. Love this product! It keeps my window-less bathroom from getting musty!